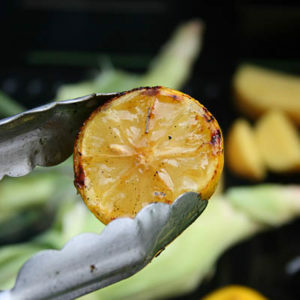 Grilled lemon slices are delicious to eat with fish or chicken. I buy organic lemons and slice them about a quarter-inch thick. Toss the slices with a little white sugar and grill those slices on both sides until they have golden brown grill marks. Set those aside and grill shrimp tossed in olive oil a couple of minutes on each side. Serve the shrimp with the edible grilled lemon slices on each plate. And you can always add a slice of grilled lemon to your cocktail, too. You can do this with oranges and limes, too.